FORT COLLINS, CO--(Marketwire - February 11, 2010) - What makes successful siblings? Is it something they're born with or is it something in the water that leads to their great achievements? For Danielson Designs and OtterBox, two Colorado businesses owned by siblings Annie Danielson and Curt Richardson, success is in their blood. As leaders in their respective industries both Danielson Designs and OtterBox have earned awards and industry recognition including acknowledgement on Inc. Magazine's Inc. 5000 list of the fastest growing private companies in the country as well as named by the Colorado Office of Economic Development and International Trade as two of the "Colorado Companies to Watch." 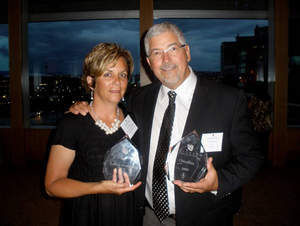 Danielson and her husband, Mark, were also honored as the "2009 CEOs of the Year" by ColoradoBiz Magazine. "Entrepreneurship is in our DNA. Our grandfather owned his own business and our father had several side businesses. Our father didn't really share his thoughts on being an entrepreneur -- he just did it and we learned by example," said Richardson, founder and CEO of OtterBox. While Richardson dismisses any suggestion of competition between the siblings and their respective businesses, Danielson has a different perspective on the relationship with her brother, "As the older brother, I don't think he ever felt competitive with me and (youngest sibling) Pete. But we were always trying to compete with him," said Danielson, owner and founder of Danielson Designs. Since the 1990s both companies have had their share of ups and downs but Danielson and Richardson have relied on the lessons they learned early in life. "What we learned from our father was that there are very few risks in life from which you can't recover and if you don't take some risks, you will miss out on some of life's greatest rewards," Danielson said. As both their companies grow and find their respective spotlights on a global stage, Danielson and Richardson continue to live their entrepreneurial legacy and prove that success runs in the family. For more information on Danielson Designs, visit www.TheStudio.DanielsonDesigns.com. To learn more about OtterBox, visit www.otterbox.com. Voted #1 in Wall Décor in the U.S. by GiftBeat Magazine two years in a row, Danielson Designs is the recognized gift and home décor industry leader in design. Danielson Designs creates décor and gifts with an authentic sensibility that's spot-on-trend and planet friendly. Danielson continues this industry-leading trend with The Studio, an online site in which your customers can customize any one of over 200 items in real time and have that item shipped in 48 hours or less from time of purchase. For more information, please visit TheStudio.DanielsonDesigns.com or call 800-746-4149 x208. Annie Danielson and Curt Richardson at the Colorado Companies to Watch awards ceremony, June 25, 2009.